The Hairy Eyeball pours a deep, dark brown with red highlights when held up to the light. A thin quarter inch head comes and goes rapidly, leaving minimal lacing on the glass. Wave your nose over the glass and you are hit with the aroma of rich roasted malt (I also detected some coffee and biscuit aromas). You can definitely taste the alcohol in this beer (to be expected given its 9% ABV), but it’s very pleasant and never overpowering. Roasted malts dominate the palate from beginning to end, and lead you to a soothing bitter finish that lingers for a long time. In case you couldn’t tell, I really enjoyed this beer. Based upon the brewer’s description, I am probably a bit late to try this one out. I should have it during the colder months, since the last thing I need during the “Dog Days of Summer” is to be any warmer. 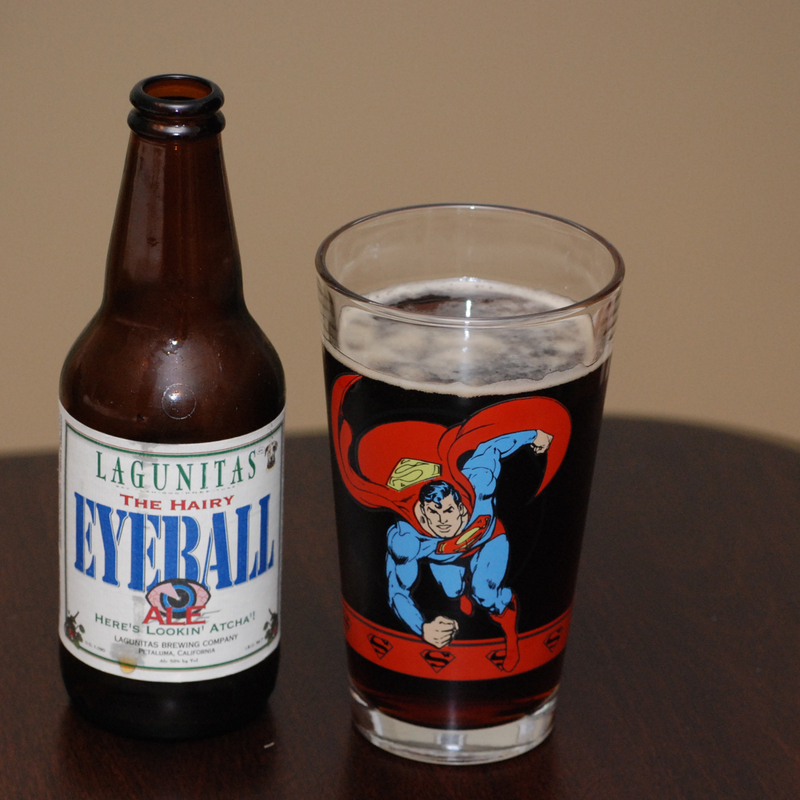 I will definitely keep an eye out for the Lagunitas The Hairy Eyeball Ale this January so that I can warm up with this delicious beer during the cold, dark days of winter. Really wish I could Lagunitas in Iowa; not so. Excellent review that made me really thirsty. Good job as always! Lagunitas makes some really interesting beers. They also have a really good sense of humor. This one is officially going on my radar. I’m now on the look out for a Superman pint glass! The wife picked me up a set of for at Target. I saw this beer over the winter and made a mental note to try it but managed to forget about it (not sure how since it has such a witty name). I’ll definitely be looking for it once the new year approaches. I’m looking forward to trying it again too. Sounds like a great beer and you know me, I gotta say I love the packaging. But, what is with the Superman glass? What are we running a booze blog that caters to guys in superhero footie pajamas living in their parents’ basements? I really liked this beer. I think part of the reason is because it was a complete surprise, i.e. I had no clue what type of beer this was until I started drinking and reading about it. Basically, I had no preconceived notions. Kind of like walking in to a movie without knowing a thing about it and just experiencing it. A very pleasant surprise! Regarding the glassware, it was a Father’s Day gift from Mrs. G-LO and the Wee Ones, so don’t make fun (there was also a Batman, Green Lantern, and Wonder Woman pint glass in the set, so stay tuned for more comic/pint glass pairings in the future)! And if the Superman glass happens to swing some beer lovers that also happen to be comic book lovers our way, then so be it! I recall a certain blogger that wears X-men t-shirts on occasion and may have a hermetically sealed vintage comic book or two somewhere in his house. But I’m not naming any names. Thanks Paula! Was torn between Batman and Superman. I love the name of this one as well!! Did the cap have a big hairy eyeball on it (I can only hope). Love the detailed description – sounds like my kind of beer! Yum! I thought the label was hilarious! As I said, I’ve been given the “hairy eyeball” on numerous occasion, so I just couldn’t resist picking this one up. Sadly, no eyeball on the cap. What? Your Green Lantern and Wonder Woman pint glasses were lost under bags of frozen smelts in the basement freezer? I’m far too disturbed to continue typing right now. Somewhere there’s a rosy cheeked child staring bleakly at a puddle of chocolate milk that has nowhere to go now that his prized Superman glass has been kidnapped…. Given the weather, I think those rosy cheeks are really sun poisoning. As far as his missing Superman glass goes, too bad! Mine! All mine! Lagunitas makes some great beers! Their IPA and Hop Stoopid are good, too. I’ll keep my eyes open for this one. Hmmm… No pun intended. And don’t forget their A Little Sumpin Sumpin. That stuff was wickedly delicious!